In our household, our children do not purchase gifts for each other. Instead, we ask them to come up with a few kind words to describe their sibling and find a local charity to donate in honor of each other. This is probably my most cherished tradition, because I love to watch the look of joy on their faces when they spend the time researching various organizations and finally come up with one that fits their sister perfectly. They take such great pride in opening up the letter on Christmas morning to see what charity will receive a donation in honor of them. There is something emotionally, physically and spiritually that happens to us when we open up our heart and give selflessly. It is this feeling that I want my own children to experience whether they do so with a financial gift or the gift of their time. The holidays should be a time when we count our blessings, remembering those who are not as fortunate. There is no better time to teach your children these invaluable lessons. From my family to yours, we wish you a happy holiday filled with light and love. We thank you for your gift of giving all year long. Mmmmmm…smell that? It’s the irresistible smell of warm pie, fresh from the Sparrow’s Nest Pie Shop! Order yours today! As we approach the end of the year, we need your help to raise much-needed funds! Donate now. Join our “Sea of Green” and become a Sparrow’s Nest Runner! Learn more at our info meetings in January. Get future editions of “The Chirp” delivered right to your Inbox — just sign up below! © Copyright 2015. 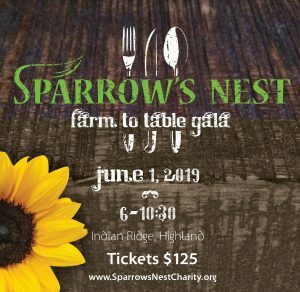 Sparrow's Nest, a not-for-profit, section 501(c)(3) charity.